Primary tumors of the paratesticular region are rare, with sarcomas constituting a major proportion, particularly in the old age. The paratesticular region consists of mesothelial, various epithelial, and mesenchymal cells and may therefore give rise to a variety of tumors. Epithelioid sarcoma usually occurs at the distal extremities of young adults. The proximal-type variant is characterized by a more aggressive course and resistance to treatment. We herein report a case of 32 years male with scrotal swelling diagnosed as proximal-type epithelioid sarcoma of paratesticular region after histopathological examination and immunohistochemistry. To the best of our knowledge, this is only the second case of proximal epithelioid sarcoma of paratesticular region in the English literature. As these tumors are rare, it has been difficult to establish their optimal treatment. Also, these can be easily misdiagnosed as other epithelioid lesions. Epithelioid sarcoma (ES), first described by Enzinger in 1970, is a rare soft-tissue sarcoma typically presenting as a subcutaneous or deep dermal mass in distal portions of the extremities of adolescents and young adults. They are divided into a “distal type,” which occurs on the upper and lower limbs and a “proximal type,” which arises on the trunk and axial locations, usually of young adults. This case report describes a case of 32-year-old male who presented with scrotal swelling which was later diagnosed as proximal-type epithelioid sarcoma (PES) of paratesticular region on histopathological examination and immunohistochemistry (IHC). Although there have been many studies concerned with various paratesticular sarcomas, yet there is only one case of epithelioid sarcoma (ES) (excluding the present case) of paratesticular region reported in the English literature. A 32-year-old male presented with scrotal swelling. On examination, both testes were normal and pushed upwards. Resection of the mass with adjacent testes was done outside and we received a specimen for second opinion. The mass was poorly circumscribed, solid, gray-white, and measured 12 × 10 × 8.9 cm [Figure 1]a. The testis was normal grossly. Microscopic distinctive features in the tumor presented herein are predominance of cells with epithelioid morphology and focal spindle cells. The cells were arranged in fascicles, bundles, and at places in cords and trabeculae. The stoma showed myxoid change. The nuclei were hyperchromatic with prominent nucleoli. The mitotic count was about 5/10 per hpf. The cells had abundant eosinophilic cytoplasm giving them a rhabdoid look. Focal areas of tumor necrosis were seen. 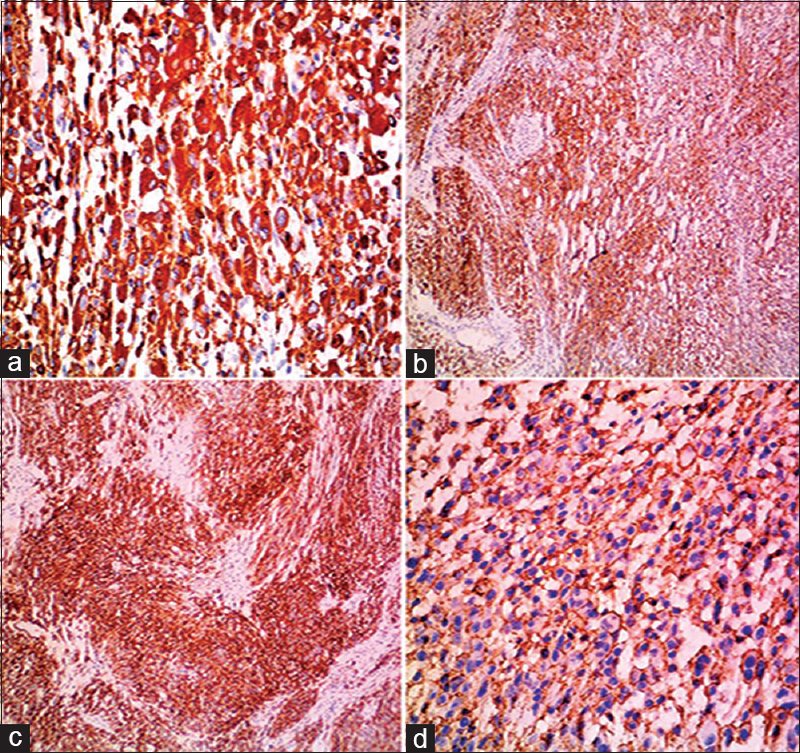 Tumor was infiltrating adjacent skeletal muscle bundles [Figure 1]b,[Figure 1]c and [Figure 2]. The sections from the testes were unremarkable. Based on histomorphology, provisional differential diagnoses of rhabdomyosarcoma, epithelioid angiosarcoma, and ES were made. On IHC, the tumor cells expressed CK, EMA, vimentin, CD34, and CA125 [Figure 3]. The tumor cells were negative for desmin, myogenin, CD31, WT1, PLAP, calretinin, CD15, MyoD1, and ERG. The tumor cells showed loss of nuclear INI-1 expression [Figure 4] and [Figure 5]. Hence, a diagnosis of ES of paratesticular region was confirmed. After the surgical resection, the patient was given three cycles of chemotherapy following our diagnosis of PES. Unfortunately, the patient succumbed 5 months after the diagnosis. Paratesticular region is a complex anatomic region histogenetically consisting of epithelial, mesothelial, and mesenchymal components. Therefore, neoplasms developed in this region belong to a heterogeneous group of tumors which demonstrate different behavioral patterns. A conventional-type ES is mostly seen in the distal extremities (commonly hand) of young adults. Lately, a non-conventional subtype of ES has been identified with a different clinical profile, termed as the “PES”. It is more frequently seen in the pelvis, perineum, and genital tract of young-to-middle-aged adults. Paratesticular region is a rare site for this entity. 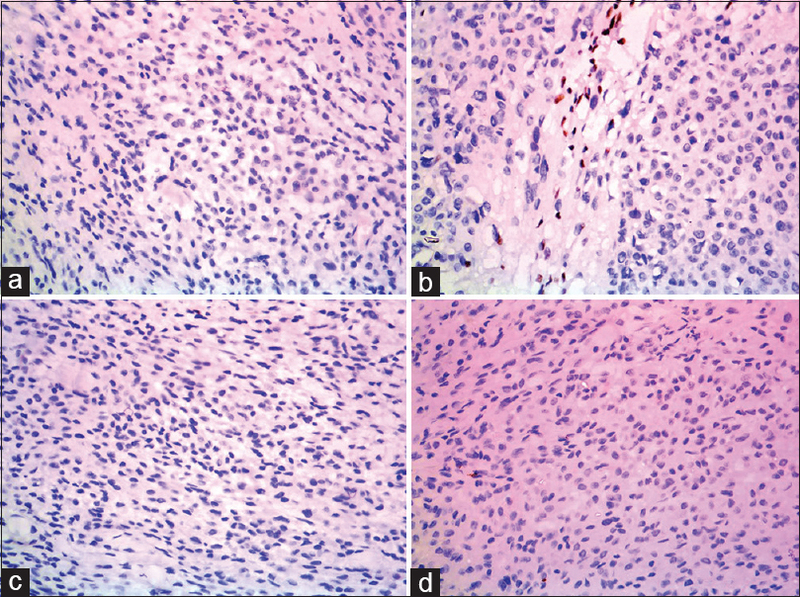 In various case series of paratesticular sarcomas, e.g., a series of 7 cases by Unlü et al., a series of 6 cases by Küçük et al., and a series of 36 cases of soft-tissue tumors of paratesticular region by Soosay et al. ; none of the tumors was ES. Also, in a series of 20 cases of proximal ES by Hasegawa et al. none was located at paratesticular region. The only case of PES in the English literature at this location was reported by Onol et al. in 2006. On histology, PES usually lacks the conventional “granuloma-like appearance.” In addition to the presence of large oval to polygonal cells in sheets with prominent nucleoli resembling a poorly differentiated carcinoma, it shows characteristic large cells with “rhabdoid” traits. It retains the immunophenotypic profile of the classic ES, with co-expression of cytokeratin and vimentin along with reactivity for CD34 in about 50% of cases. 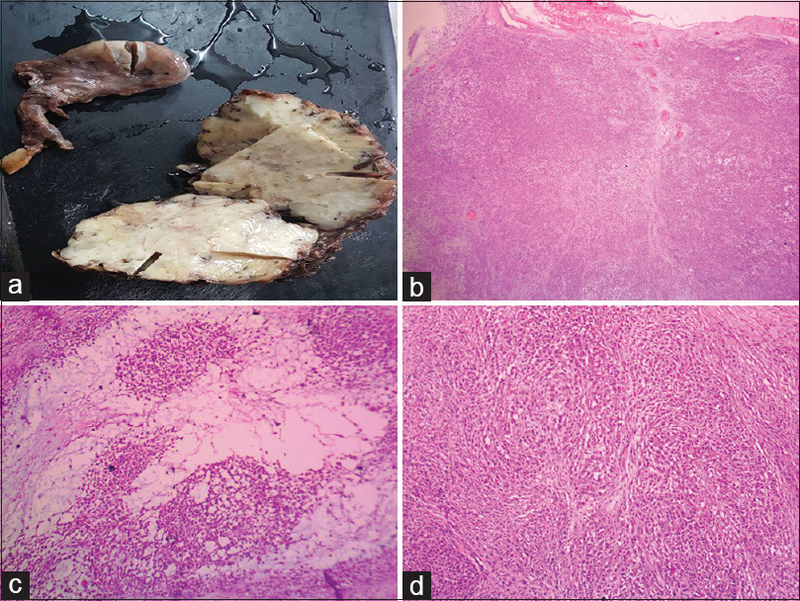 On histopathological examination, this tumor has to be differentiated from other epithelioid appearing malignant soft-tissue neoplasms: rhabdomyosarcoma, angiosarcoma, melanoma, malignant peripheral nerve sheath tumor, and undifferentiated carcinoma. IHC is useful to delineate cell lineages to certain extent. Tumor location and patient age can be helpful, as most malignancies have typical location patterns. Morphologically, ES can be differentiated from squamous cell carcinoma (SCC) as it lacks epidermal involvement, intercellular bridges, and keratinization. Sarcomatoid variant of SCC can be difficult to differentiate based only on morphology. In such a situation, limited panel would not help and an extensive list of IHC markers is required to confirm or exclude ES. ES can be differentiated from malignant melanoma by lack of skin involvement and absence of melanin pigment. Amelanotic melanoma can be a difficult differential to exclude and again one has to do complete IHC profile to reach a diagnosis. High degree of suspicion and extensive IHC workup using relevant markers is mandatory to reach a conclusive diagnosis. Case presented herein is a 32-year-old male with a mass at paratesticular region measuring 12 × 10 × 8.9 cm which showed histomorphological features of PES. The tumor cells expressed CK, EMA, vimentin, CD34, and CA125. The tumor cells were negative for desmin, myogenin, CD31, WT1, PLAP, calretinin, CD15, MyoD1, and ERG. The tumor cells showed loss of nuclear INI-1 expression. Several recent studies have emphasized the utility of INI-1 IHC in confirming the diagnosis of ES by demonstrating loss of protein expression in the vast majority of both conventional and proximal subtypes. Expression of CD34, as seen in the present case, helps to distinguish PES (positive in 50% of cases) from malignant rhabdoid tumor. PES are more aggressive than the conventional type as seen in a case series of 20 cases, 65% of the patients developed local recurrence, with most patients having multiple recurrences, and 75% of the patients developing metastases. Only 30% of the patients were alive at the last follow-up. In a comparative study between conventional ES (26 cases) and PES (14 cases) by Rekhi et al. it was found that the 7-years disease-free survival was 19.4% in the conventional ES and nil in the PES. The overall survival rate was also lower in PES (31.3%) than the conventional type (90.2%). Recurrences (83.3%) and metastases (41.6%) were also found to be more common in the proximal subtype. Hence, it is important to diagnose this subtype because of its more aggressive clinical behavior than the classic type. We present this case to emphasize the importance of IHC in the establishment of diagnosis for this uncommon tumor. To the best of our knowledge, this is only the second case of proximal ES of paratesticular region in the English literature. 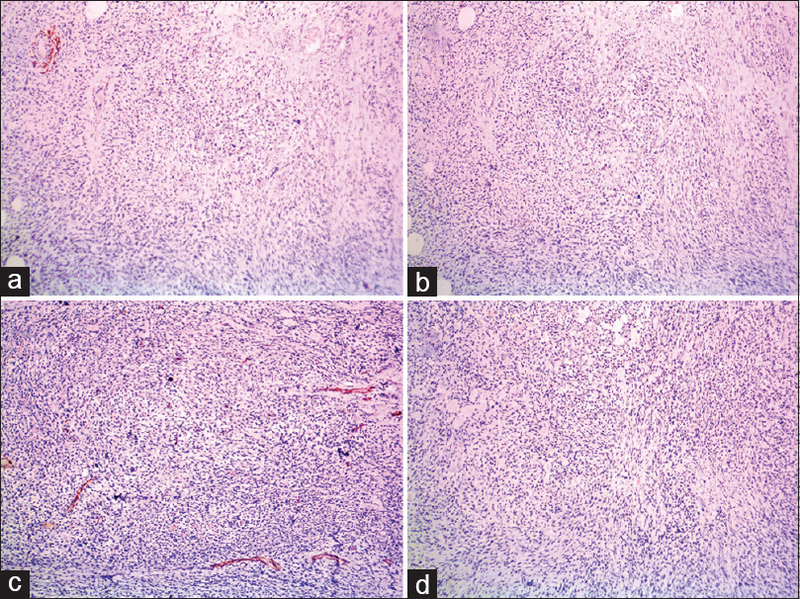 The present case highlights the difficulties in diagnosing this rare entity because of its uncommon location and histological mimics which can be overcome by judicious use of IHC markers. An early diagnosis is essential for determining further management and a close follow up for recurrence. Mahatma Gandhi Cancer Hospital, Miraj. Enzinger FM. Epithelioid sarcoma. A sarcoma simulating a granuloma or a carcinoma. Cancer 1970;26:1029-41. Guillou L, Wadden C, Coindre JM, Krausz T, Fletcher CM. “Proximal-Type” epithelioid sarcoma, a distinctive aggressive neoplasm showing rhabdoid features. Am J Surg Pathol 1997;21:130-46. Khoubehi B, Mishra V, Ali M, Motiwala H, Karim O. Adult parat- esticulartumours. BJU Int 2002;90:707-15. Unlü Y, Huq GE, Ozyalvaçli G, Zengin M, Koca SB, Yücetas U, et al. Paratesticular sarcomas: A report of seven cases. Oncol Lett 2015;9:308-12. Küçük Ü, Bayol Ü, Pala EE, Akman Ö, Divrik RT. Paratesticular sarcomas: Our case series. Turk J Urol 2013;39:84-9. Soosay GN, Parkinson MC, Paradinas J. Paratesticular sarcoma revisited: A review of cases in the British Testicular Tumor Panel and Registry. Br J Urol 1996;77:143-6. Hasegawa T, Matsuno Y, Shimoda T, Umeda T, Yokoyama R, Hirohashi S. Proximal-type epithelioid sarcoma: A clinicopathologic study of 20 cases. Mod Path 2001;14:655-63. Onol FF, Tanidir Y, Kotiloǧlu E, Bayramiçli M, Turhal S, Türkeri LN. Proximal type epithelioid sarcoma of the scrotum: A source of diagnostic confusion that needs immediate attention. Eur Urol 2006;49:406-7. Hornick JL, Dal Cin P, Fletcher CD. Loss of INI1 expression is characteristic of both conventional and proximal- type epithelioid sarcoma. Am J Surg Pathol 2009;33:542-50. Rekhi B, Gorad BD, Chinoy RF. 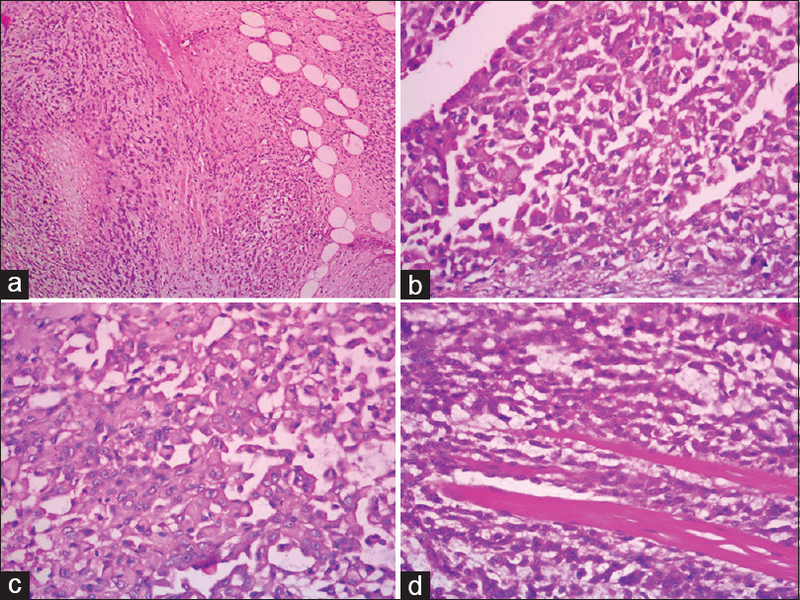 Clinicopathological features with outcomes of a series of conventional and proximal- type epithelioid sarcomas, diagnosed over a period of 10 years at a tertiary cancer hospital in India. Virchows Arch 2008;453:141-53.